I augur you one good permanence! Recently, myself and my brothers travelled to Sardinia for a cycling holiday. During our visit we stayed in a small, family-run hotel in the northern city of Alghero. 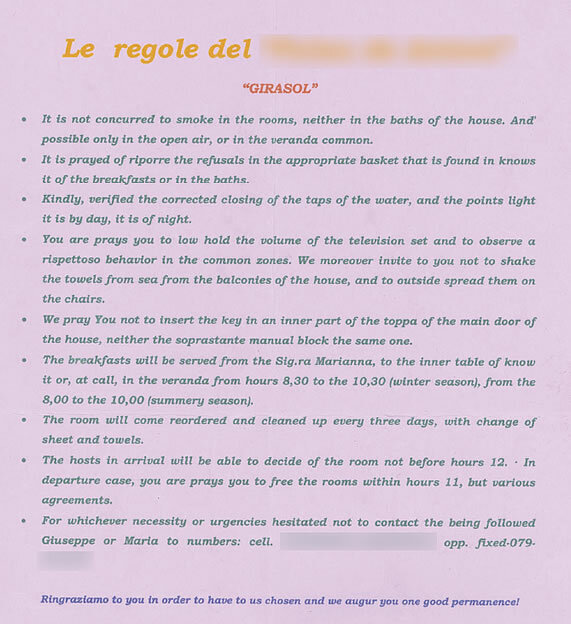 While the accommodation was of a high standard, we were left both baffled and amused by an English translation of the house-rules pinned to the bedroom doors. 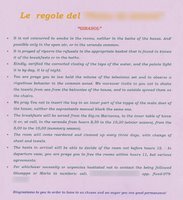 Click this image to read the hilarious house rules. "Kindly, verified the corrected closing of the taps of the water, and the points light it is by day, it is of night"
"We pray you not to insert the key in an inner part of the toppa of the main door of the house, neither the soprastante manual block the same one"
As well as being hilariously funny, this also has a serious point. It shows what could happen to your website if you put too much faith in an online translation tool. I experienced this in France a year ago. Except they had translated the dinner menu, by the time the waiter came over we could hardly speak. Wine and heat had gone to our heads by then and we couldn't keep a straight face when trying to order.